We are now in this war. We are all in it all the way. Every single man, woman, and child is a partner in the most tremendous undertaking of our American history. We must share together the bad news and the good news, the defeats and the victories--the changing fortunes of war.
. . . This Government will put its trust in the stamina of the American people, and will give the facts to the public as soon as two conditions have been fulfilled: First, that the information has been definitely and officially confirmed; and, second, that the release of the information at the time it is received will not prove valuable to the enemy directly or indirectly. To carry out these policies the Government had to set up machinery for safeguarding information and to expand greatly the facilities available for the dissemination of information both at home and abroad. On the domestic front it was the job of the information agencies to help keep 130 million Americans working full speed to get the war work done, whether this involved carrying a rifle, piloting a plane, producing food, working in a factory, or sitting at a desk. Abroad, it was the job of these agencies to help keep the United Nations working together with maximum effort toward common goals, and to convince the world that in the long run the United Nations could not be beaten, and that a fair peace could be realized only with a United Nations' victory. On all of these topics the Government had to provide as much information as possible, consistent with military safety, to maintain the highest degree of truth and at the same time to be persuasive, to provide information at the right time, to distribute this information on the broadest possible scale, and through as many communication channels as possible, and to counteract enemy propaganda at home and abroad. The German, Italian, and Japanese Governments attempted to sow seeds of disunion among the Allies. Axis short-wave radios sought to create distrust between England and the United States, to portray the Nazi attack upon Russia as a crusade against communism and to spread the view in this country, as well as in Asia, that both britain and America were engaged in a racial war against the colored peoples of the earth. Soon after Pearl Harbor, a Nazi broadcaster to America shouted: "British naval circles are finding encouragement in the defeat suffered by the United States. "1 German broadcasts charged that landing of American troops in North Ireland in January 1942 was timed "to coincide with Roosevelt's gradual absorption of Australia and Canada," that "American foreign policy is dictated from Downing Street rather than from Washington, and will leave America holding the bag," and that "the British Empire is dissolving like a lump of sugar into Roosevelt's teacup". Special efforts were also made to disrupt Western Hemisphere amity by accusing the United States of imperialist aims in Latin America. The Axis propagandists found fertile soil from some of their disruptive activities in the pessimism, intolerance, and apathy of certain elements of the American people. Surveys of the press and samples of current public opinion show that signs of frustration and dissension became apparent in certain sections all too soon after Pearl Harbor. While the majority recognized the seriousness of the war, were determined to win it, and approached post-war problems with a high measure of idealism, certain elements sought to limit American participation in the war to the protection of American territory, portrayed the British as craven, incompetent, and responsible for American involvement in the conflict, pictured Russia as a menace to Western civilization, and sought to undermine public confidence in the good faith of the United States Government. ignorance of the nature and interrelationships of the economic controls necessary to regulate the cost of living; failure to comprehend the need to curb excess buying power as a means of preventing inflation; a widespread lack of mutual confidence between groups, particularly between labor and other groups; and a feeling on the part of a substantial minority that the Government was giving the people inadequate information about military and naval events. The handling of the news regarding the attack on Pearl Harbor presented in acute form most of the information problems facing our Government at war. It was imperative to keep the Japanese from finding out anything about damage done that would be of use to them. The public relations offices of the Army and Navy imposed a strict silence at first and referred the newsmen to the White House, which furnished a statement giving few details. American newspapers and broadcasters employed accounts of the disaster obtained from Japanese sources. Although these sources were identified, the use of them conveyed to the public an enemy version of the events which raised doubts about the adequacy and accuracy of American official information. While Secretary Know issued a report a week later which was based on first-hand observations, and while a special Board of Inquiry headed by Supreme Court Justice Roberts made a report in January, rumors exaggerating the damage persisted and the President had to deny these rumors in his radio talk of February 23, 1942. Under a regime of freedom of the press, success in the dissemination of war information depends in last analysis upon securing the cooperation of the press and radio. If Government releases are to be run as news items, if Government messages are to be broadcast to radio listeners, or if Government themes are to be shown in the newsreels or in motion picture shorts, the industries concerned must volunteer their services. Negatively, the Government had to rely upon the voluntary cooperation of the press and radio to refrain from publishing materials which would serve the purposes of the enemy. In times of war, the person in the United States who can command the fullest cooperation of the press and radio is the President. Franklin D. Roosevelt's audiences now became world-wide. To unequalled American radio audiences were added the listeners to American and British short-wave broadcasts. directed toward ultimate good as well as against immediate evil. We Americans are not destroyers--we are builders. We are now in the midst of a war, not for conquest, not for vengeance, but for a world in which this nation, and all that this nation represents, will be safe for our children. We are going to win the war, and we are going to win the peace that follows. Most of the press and radio commentators followed the President's lead in picturing the war in planetary terms, accepting the kinship of all peoples fighting fascism, and defining our goal as nothing less than total victory. In his address of January 6, 1942, the President amplified his position and listed the following war themes: All-out production, civilian sacrifices, offensive warfare, protection of the four freedoms, the nature of the conspiracy against us and against our way of life, the counter-strategy of the United Nations, and the necessity for guarding against complacency on the one hand and defeatism on the other. In his radio address on Washington's Birthday, the President took up the cause of the United Nations and made an eloquent plea for cooperation and comradeship with our Allies. Among other important addresses that the President made during the first 9 months of the war should be mentioned his radio address of April 28, 1942, outlining a seven-point program for control of the cost of living. It was the task of the information agencies to follow the President's lead and carry the war of words to the enemy. Among the organization questions to be decided were whether censorship and information activities should be combined, whether domestic and foreign information should be disseminated by the same agency, and whether there should be a centralized war information office which would serve all of the war agencies. The attack on Pearl Harbor found the United States with no organization to prevent valuable information from reaching the enemy since censorship was not regarded as a proper function for our Government in time of peace. The First War Powers Act conferred on the President the powers of censorship. He had to decide how and by whom these powers would be exercised. He was faced with the question whether to follow in the footsteps of President Wilson, who, in World War I, delegated to George Creel, Chairman of the Committee on Public INformation, responsibility for both war information and voluntary censorship. Mr. Creel's office laid down the rules for the voluntary censorship of the press and was also a central source for war information. The British experience with its Ministry of Information which combined censorship and propaganda functions had not been particularly happy. on for more than 20 years by representatives of the Army, Navy, Post Office, and Justice Departments. Early in 1941 the Joint Army and Navy Board presented to President Roosevelt a plan for censorship in case of war which provided that the President appoint a Director of Censorship who would have no responsibility for issuing information. The plan did not stipulate that the Director should be a civilian, although such a provision had been in the plan of the old Censorship Board of World War I. Under the 1941 plan, the President was to designate an Army officer as chief postal and wire censor and a Navy officer as chief radio and cable censor. The President approved this plan on June 4, 1941, and appointed a committee the following November under the chairmanship of the Postmaster General to work out the details. The Committee asked the Director of the Federal Bureau of Investigation to make a comprehensive study of the subject. This study, completed on December 7, recommended that there should be no restrictions on the President in the selection of a Director who would be given absolute authority over censorship. The Director of Censorship shall cause to be censored, in his absolute discretion, communications by mail, cable, radio, or other means of transmission passing between the United States and any foreign country or which may be carried by any vessel or other means of transportation touching at any port, place, or territory of the United States and bound to or from any foreign country, in accordance with such rules and regulations as the President shall form time to time prescribe. of the war; i.e., intercepts on conditions in enemy countries, on attempted evasion of export and import regulations, on enemy shipping, on available sources of war materials, on new industrial developments of military importance, and on financial transactions that were related to the war. The agency was entirely divorced from the job of giving out information. Censorship operations actually began on December 7, 1941, when the President directed the Navy Department to censor cable and radio communications and the War Department to censor postal communications going in and out of the country. When the Office of Censorship was established, a Cable Division under the leadership of naval officers and a Postal Division under the leadership of Army officers became the two principal operating divisions. As President of the United States and Commander in Chief of the Army and Navy, I hereby authorize and direct you in your capacity as Director of Censorship to coordinate the efforts of the domestic press and radio in voluntarily withholding from publication military and other information which should not be released in the interest of the effective prosecution of the war. Press and radio censorship was accomplished by the issuance of codes stating what might and might not be published and requesting voluntary compliance of press and radio. To a great extent, the War and Navy Departments and the Maritime Commission determined the kind of restrictions which went into these codes. While most of the military information was censored at source by the Army and the Navy, it was possible for the private news agencies to get information from nonofficial sources about troops, ships, fortifications, and war production which would be of value to the enemy. The Office of Censorship established a small Press Division and a small Radio Division to formulate the codes and guide their interpretation. Voluntary censorship must deal only with questions involving war security. It must never base a request on any security consideration which may be questionable. The danger to security must be real, and must be backed by a solid and reasonable explanation. It must avoid any interference whatever with editorial opinion. Such opinion could not possibly be controlled on a voluntary basis, even if it were desirable. It must never be influenced by nonsecurity considerations of policy or public needs. Any involvement in these fields would destroy effectiveness elsewhere. It must make no request which would put the press in the position of policing or withholding from publication the utterances of responsible public officials. It must make every effort to avoid multiple censorship and on no account must withhold from the American public any information which has been generally disseminated abroad. It must never undertake to vouch for the truth or accuracy of any news story. The embarrassments would be too great for a voluntary system, based on security, to survive. It must never undertake to regulate release dates or other matters of newspaper ethics. To do so would encourage Government interference of a considerable and possibly uncontrollable character. It must be absolutely impartial and consistent. If any censor is to maintain a position of influence, his blue pencil must know no brother among competitors. During the first 8 months of 1942 the Press and Radio Divisions of the Office of Censorship were busy keeping the news services informed about how the codes applied to particular events. The sinkings of ships off the Atlantic Coast by German submarines, the shelling of the southern California coast by a Japanese submarine, the burning of the Normandie in New York Harbor, the visits of Churchill and Molotov to the United States, and the constant danger of the inadvertent publication of military addresses presented censorship problems that had to be solved promptly by these Divisions. The Office of Censorship answered questions and called attention to violations. It had no powers of compulsion over domestic press and radio. in formulating the policy were the Army, the Navy, the War Production Board, and the Division of Statistical Standards of the Bureau of the Budget. In March OFF issued a still more comprehensive statement of policy on war information covering news of military action as well as news of war production. So skillfully did the Office of Censorship work out the administration of voluntary censorship of press and radio that there were few complaints from the public. Surprisingly, the Director of Censorship was frequently found on the side of news agencies urging the War and Navy Departments to be more liberal in their releases of war news. There were violations of the codes, particularly by small newspapers which inadvertently published news about native sons in the armed services, but these violations were minor, and it was not necessary to resort to compulsory censorship of press and radio in order to safeguard national security. Although the creation of the Office of Censorship theoretically separated the powers of censorship and the duty of issuing information, and appeared to set up one supreme authority for censorship, these powers were already widely disseminated. Though the office of Censorship could issue codes of security regulations, and intercept communications to citizens or communications abroad, it could not deal with Government censorship at source; that is, the refusal of a Government agency or official to issue information. Every information agency was in one sense a censor since it had the power of deliberate choice of what it would issue and how it would issue it. Actually, too, there was delegation of the power of censorship. The Office of Facts and Figures outlined the principles to govern the issuance of Government releases, and the public relations departments of the Navy and the Army both had the power of censorship over military releases and all communications that dealt with military personnel. The Office of Censorship was a new and independent war agency which had no peacetime counterpart. the dissemination of war information, on the other hand, was carried on by agencies and offices which had been established on a piece-meal basis before Pearl Harbor. These agencies lacked adequate powers to do a war information job and they got in each other's way. The advent of the war made necessary a realignment of both responsibility and organization in order that consistent and accurate war information could be carried to the people of the United States and of the world. keeping the public informed regarding the war effort. Mr. Creel's office was the central source for all war information, including the releases put out by the State, War, and Navy Departments.5 President Roosevelt did not set up any central organization at first. He followed the familiar pattern of establishing a series of parallel agencies whose powers or fields of authority were not sharply limited, both because of the urgency of the need, which allowed little time for organization, and because the functions of public information in a global war were not yet clarified. The handling of military information was left in the War and Navy Departments and the handling of diplomatic information in the State Department. The War Department Bureau of Public Relations was established by a memorandum from the Secretary of War, dated February 11, 1941, which placed all agencies of the War Department dealing in public relations or related matters under the supervision of the Bureau. Public relations offices were established in the headquarters of each theatre of operations to provide continuous access to important announcements by commanding generals overseas. The Office of Public Relations of the navy Department was established in the Office of the Secretary on May 1, 1941, and was expanded after Pearl Harbor to meet wartime needs. The War and Navy Departments together devised a system of accrediting war correspondents which facilitated the sending of reporters to all the fighting fronts. In addition to the information offices of the State, War, and Navy Departments, five other agencies were working on defense information. The Division of Information of the Office for Emergency Management provided central information facilities for the OEM agencies; the Office of Facts and Figures formulated war information programs and acted as a clearing house for certain types of domestic information; the Office of Government Reports handled inquiries coming from State and local governments, citizens' organizations and the public; the Foreign Information Service of the Coordinator of Information disseminated information to all foreign countries other than the Latin American; and the Coordinator of Inter-American Affairs sent information to the American republics. opportunity to check possible conflicts in advance of their occurrence, and would permit the most economical use of information manpower. In Washington centralization meant a central press room reserved for reporters, a central distribution system for releases, pictures, posters, and other information materials, and centralized facilities for producing information with information men assigned to individual emergency agencies but responsible to Mr. Horton in the central office. It was the function of the men assigned to different agencies to prepare releases and answer questions regarding developments for their agencies. The staff of the OEM Division of Information assigned to the War Production Board, for example, was charged with reporting, interpreting and explaining the manifold activities of WPB. Among the subjects covered were the conversion of peacetime industries to war production; the curtailment of normal production; the conservation of raw materials and expansion programs; the rubber, metal, paper, and other salvage campaigns; the preparation of military production schedules; subcontracting; programs to benefit small businesses and industries; requisitioning of inventories and idle stocks; clearing of major war contracts; and the preparation of programs drafted to preserve the minimum civilian economy in time of war. One of the accomplishments of the Division of Information was the initiation of the War Production Drive. Shortly after his appointment as Chairman of WPB, Mr. Nelson requested the Division of Information to plan a national campaign to spur production. On February 2, 1942, he took this matter up with the Committee on War Information of the Office of Facts and Figures, which agreed that the program should have goals and incentives for individual companies and for individual workers. The Division of Information worked out a plan for a War Production Headquarters to administer the drive. General policies were determined by a joint policy committee composed of representatives of the Army, the Navy, the Maritime Commission, and the War Production Board. By June 1942 nearly 100 labor-management committees had been established, a number of important labor unions had participated in the drive, slogan contests had been held all over the country, and an individual awards program was started in order to encourage the submission of suggestions by workers. Manufacturers testified that the drive was having favorable results. what kind of production information could be made public. The Committee on War Information of the Office of Facts and Figures had the question on its agenda during the same period. The staff of the OEM Division of Information assigned to the Office of Price Administration found its work vastly increased by the declaration of war. With the coming of rationing and price actions on consumer goods, this staff had to carry on the educational campaigns to inform the public why such actions were necessary, how they would be carried out, and what the ordinary citizen would do to adjust himself to the new situation. Long before the general maximum price regulation was announced, the information staff indicated that the implementation of the program would require, in order to secure general public and businessman acceptance, a very comprehensive publicity and promotion campaign. When the regulation was ready, materials were distributed in advance for simultaneous release in Washington and the field. As far as newspaper coverage was concerned, the information campaign was highly successful. Some papers carried the full text of the regulation and hundreds of others carried the text of the release. This type of coverage more effectively reached the large urban retail stores than the small retail stores in the rural areas. It was also more effective in securing general compliance with the principle of a ceiling than it was in securing compliance with the details of administration, such as price posting and record keeping. The staff of the Division felt that in order to secure compliance with technical instructions, it was necessary to supplement a general information campaign with a direct check-up by Government officials at each retail establishment. of the people and to make use of the protective facilities organized by these governments. OCD had no direct authority over such governmental units but could only suggest what they should do in the way of cooperation. OCD was allowed to set up its own information office, called the Public Advice and Counsel Division, after some negotiations with the Bureau of the Budget. The staff of the OEM Division of Information assigned to OCD was reassigned to other duties on February 7, 1942. While the OEM Division of Information concentrated its resources most heavily upon the information needs of the Office of Price Administration and the War Production Board, it also provided central information services for many other emergency agencies. It assumed responsibility for the information work of the Office of Lend-Lease Administration, the Combined Raw Materials Board, the Office of Defense Transportation, the Alien Property Custodian, and the War Relocation Authority, and it established liaison service with the Coordinator of Inter-American Affairs, the Coordinator of Information, the Economic Defense Board, the Office of Agricultural War Relations, the Office of Scientific Research and Development, and the Office of Defense Health and Welfare Services. The liaison services involved the furnishing of basic source materials and the coordination of information programs. In the spring of 1942 information campaigns were organized on conversion, rationing, salvage, and "hush hush" by the Division of Information. The last-mentioned campaign aimed to impress upon both military and civilian personnel the importance of refraining from loose talk which might aid the enemy. In these campaigns, the widest possible coverage and effect were sought by the coordinated use and timing of releases, radio programs, pamphlets, posters, speeches, motion pictures, and other media. Such campaigns depended upon the cooperation of the press, the national advertisers, the broadcasting companies, and the motion-picture companies, since it was not in the American tradition for the Government to buy newspaper space, radio time, or news-reel footage to put over a war program. The fullest use of the information campaign technique was not achieved during this period because the Division of Information did not have an adequate staff to do the job and it had no control over the Office of Facts and Figures and the old-line departments. it had to be in the hands of persons who understood all the ramifications of the specific program, who possessed zeal for the special prosecution of that program, and who were just as subject to the control of the agency head as any other employee of the agency. Not only the Office of Civilian Defense, but the Office of Defense Health and Welfare Services and the Division of Defense Housing Coordination sought their own information units. The Office of Facts and Figures, established under Archibald MacLeish, Librarian of Congress, shortly before the attack on Pearl Harbor, was designed to coordinate defense information functions on the home front. Its authority was not fully recognized, however, by the Division of Information within the Office for Emergency Management which handled publicity and releases for the war agencies. At first it concerned itself with information policies. The organization of OFF consisted of the (interdepartmental) Committee on War Information, a board, and four operating bureaus. Represented on the Committee were the State, War, Navy, Treasury, and Justice Departments, the Coordinator of Information, the Coordinator of Inter-American Affairs, the Office of Government Reports, the Office of Lend-Lease Administration, the Office of Civilian Defense, and the Office for Emergency Management. The Board of Facts and Figures included the eight OFF deputy directors, the heads of the operating bureaus, the Director of the Office of Government Reports, the DIrector of the Foreign Information Service of the Coordinator of Information, and a market research consultant. The Committee on War Information tried to act as the war information planning agency on the domestic front. It advised war agencies on information matters, formulated general principles regarding the security of war information, outlined general propaganda objectives in the domestic field, including counter-propaganda themes, reviewed the findings of the OFF Bureau of Intelligence regarding the status of domestic public opinion and the nature of the enemy propaganda, suggested subjects for the Bureau of Intelligence to investigate, suggested topics for publications and radio programs, defined the functions of OFF in the fields of speech clearance, in the coordination of radio programs, and in the coordination of the production and distribution of posters, endeavored to get more war information from the Army, the Navy, and the civilian war agencies, drew up principles to guide the use of advertising by war agencies, and considered the handling of minority groups in the United States. other agencies concerned with domestic information and morale problems, the utilization of OFF reports, relationships between Government information officers, and the determination of the use to be made of different media. The President's message on the State of the Union was taken as the basis of an over-all information program and in connection with the President's anti-inflation speech, meetings were arranged with the representatives of the departments concerned. OFF served as a clearing house for the press, radio, and motion picture industries endeavoring to aid the war effort. Since there was nothing in its Executive order on this function, it had to work out ways of securing the maximum cooperation with the industries with a minimum of friction with other governmental agencies. By a letter from Stephen B. Early, Secretary to the President, dated January 16, 1942, OFF acquired certain coordinating functions over Government requests for radio time. To prevent duplication of effort within the radio field, OFF prepared an over-all schedule of the radio plans of each Federal agency. In cooperation with the radio industry an allocation plan was prepared which provided for an orderly distribution of, and proper emphasis on war themes in radio programs. The powers of OFF were extended to the clearance of speeches by high-ranking officials by a letter from Mr. Early. At its meeting of January 19, 1942, the Committee on War Information authorized Mr. MacLeish to send a letter to the President calling attention to such statements as those made recently by Secretary of Commerce Jones on rubber, by Secretary of Agriculture Wickard on sugar, and by Secretary of the Navy Know on the Pacific front, and recommending that the President establish a method of clearing such statements so as to avoid intragovernmental conflicts. On January 29,l 1942, Mr. Early authorized OFF to undertake this function. In the poster field OFF acquired clearance powers by negotiating voluntary agreements with the war agencies which, in planning their poster programs, discovered that they needed some system for allocating the available space among the various Government agencies. press releases itself and those which it did were largely concerned with counterpropaganda. Since it did not have a clear directive to do a war news clearance job, it relied chiefly upon persuasion. The shortcomings of the OFF Executive order were abundantly clear to Mr. MacLeish. In a letter to the Director of the Bureau of the Budget, dated February 20, 1942, he urged the liquidation of OFF and the establishment of a stronger agency which would combine the functions of other agencies in the field of war information. A third domestic information agency was the Office of Government Reports, established in the Executive Office of the President in 1939, some of whose activities originated in the National Emergency Council established in 1933. The Director of OGR was Lowell Mellett, former editor of the Washington Daily News. While the OGR central press-clipping services, public, inquiry offices, and field services which included public-opinion reporting, the handling of Federal-State relationships, and the reporting on Washington-field administrative problems, were established as peacetime activities, they were greatly expanded after the attack on Pearl Harbor. The public-opinion reporting facilities of the field officers were used to analyze war production, price control, and rationing problems, thus duplicating some of the assignments of the OFF Bureau of Intelligence. information activities, on how foreign information policies should be determined, or on how these policies should be carried out. Whereas the domestic information agencies relied heavily upon the voluntary cooperation of the press, radio, and motion-picture industries, it was soon clear that the disruption of international communications by the war would make it necessary for our Government to distribute information abroad in order to reach the peoples of enemy, occupied, neutral, and Allied countries. While some of the commercial news services were continued on a reduced basis in neutral and Allied countries, the Government had to supplement these services in order to combat the insidious influences of Axis propaganda. When the Japanese struck at Pearl Harbor, the dissemination of information abroad was in the hands of two emergency agencies, the Office of the Coordinator of Inter-American Affairs, which confined such activities to Latin America, and the Office of the Coordinator of Information, which operated in the rest of the world. Since it was imperative that Government information sent outside of the country conform with our foreign policy and military strategy, the State, War, and Navy Departments helped coordinate the activities of these two agencies. The information programs directed toward Latin America were within the jurisdiction of the Coordinator of Inter-American Affairs, Nelson Rockefeller, who, since August 16, 1940, had operated a well-rounded program for the development of goo inter-American relations. The press, radio, and motion-picture activities of the CIAA were regarded as an integral part of its general cultural and commercial relations program which was worked out in close cooperation with the State Department. The separate treatment of the Western Hemisphere was reaffirmed in the Executive order of July 30, 1941, which established CIAA in OEM. WHen war was declared, Mr. Rockefeller's agency helped convince the Latin Americans that hemisphere solidarity was necessary for hemisphere defense. CIAA was particularly effective in supplementing the commercial news services with special features, local information activities, film distribution, and advertising. William J. Donovan, and the President. The agency was directed by the President not to engage in domestic information activities. To carry out the overseas information program, Colonel Donovan established a Foreign Information Service and appointed Robert Sherwood to direct it. In accordance with policies which were cleared with the State, War, and Navy Departments, and in close cooperation with the British Government, this Service undertook to speared the gospel of democracy and the cause of the United Nations throughout the world except in Latin America. The Service contended that a democratic country cannot successfully undertake a Goebbels-deception type of foreign propaganda and that truth was the only effective basis for American foreign information, although the facts thus disseminated had to be carefully interpreted and timed on basis of a strategy entirely different from that involved in domestic information work. In concentrated on giving volume, tone, and meaning to an American approach. Radio programs were presented as "The Voice of America," not as the voice of this or that refugee or immigrant group. Use was made of PResident Roosevelt as a symbol of American idealism. While emphasis was placed upon American power, equal attention was given to the American aid to end the war under circumstances which would make a real peace possible. Mr. Sherwood was keenly aware of the need for coordinating our overseas efforts. He felt that the news-gathering functions of his Service were duplicated by the OEM Division of Information and by CIAA. This duplication, he said, would be unnecessary if some system could be worked out whereby his organization could get the news it needed to operate. He was also aware that his unit, OFF< CIAA, and the OEM Division of Information duplicated each other in their contacts with other governmental agencies. At the outbreak of war, both the Rockefeller and Donovan agencies were developing the use of short-wave broadcast facilities in their foreign information programs. Since the short-wave radio, no matter how carefully it may be beamed toward a given country, can be picked up by neighboring countries, the general and detailed operational policies of the two agencies had to be harmonized. Any discrepancy between the broadcasts to South America and the rest of the world would be quickly picked up by the enemy and used to discredit American information in general. For instance, there were differences between the two agencies as to the emphasis to be placed on news regarding our aid to Russia. The Latin American countries were jealous of Russian aid because of their own shipping shortages. Close coordination between the two agencies was also necessary because of the shortage of radio equipment and technical personnel. The confusion in handling war information, both domestic and foreign, was such that demands for a reorganization came from all quarters. A number of Presidential advisers recognized that the situation was unsatisfactory and took steps to see that the lines of responsibility were more specifically fixed and that a coordinating mechanism was established. The staff of the Bureau of the Budget proposed a draft of an Executive order providing that the following agencies or functions should be consolidated in to a proposed Office of War Information: the Office of Facts and Figures, the Foreign Information Service of the Coordinator of Information, the functions of the Coordinator of Inter-American Affairs relating to the dissemination of information, the functions of the Director of the Office of Government Reports in his capacity as Coordinator of Government Films, and the general functions of the Division of Information of the Office for Emergency Management. War agencies of the Office for Emergency Management received their own press and publications services and set up their own information offices. This assignment of local offices meant the abandonment of the centralized information services which the OEM Division of Information had been performing for WPB, OPA, and other war agencies. The main features of this draft were eventually adopted by the process of negotiating acceptance took time. This multiplicity of general war information agencies has resulted in conflict and duplications in the flow of war information to the American public and to other nations. An example of present duplication is the dual coverage of the official news each day, once for domestic (by OEM) and once for foreign use (by COI). Furthermore, there is uncertainty with respect to areas of responsibility and authorized points of clearance. Much information released daily is still of the "agency glorification" type and is not designed to implement an over-all war information policy. There is competition in obtaining funds, building staffs, and preempting special fields of information. Conflicts in press releases have been numerous, as for example, the contradictory statements recently issued on the rubber situation. Coordination between domestic and foreign information programs has been weak. Finally, there has been too much reliance placed on "making the press" as opposed to the development of information programs designed to stimulate citizen understanding of the war effort. Thus, there has been overemphasis on reporting, and underemphasis on long-range planning, interpretation, and program effectuation. and posters. The plan recommended in the attached Executive order, therefore, provides for decentralization to the individual war agencies of information work relating specifically to their own activities. On the other hand, it provides for the centralization of general war information work and of Government sponsored radio, motion-picture, and poster programs. . . . The Office of War Information would be headed by a Director appointed by the President. The Director would be assisted by a Committee on War Information Policy which would formulate basic war-information policies and plans to govern the various agencies in the development and dissemination fo war information. The most important policy issue involved in the proposed plan concerns the transfer of the information acitivites of Mr. Rockefeller's office. I believe that the control of short-wave broadcasting facilities and the general control of foreign information policy should properly be located in the new office. However, inasmuch as the information acitivites of the Coordinator of Inter-American Affairs are an integral part of the program of that Office, I think it may be advisable to arrange for the Coordinator of Inter-American Affairs to continue the operation of radio and other information programs for the American Republics, subject to policy and program control by the Office of War Information. In effect, the Coordinator of Inter-American Affairs would, under this arrangement, serve as the agent or deputy of the Director fo the Office of War Information in carrying out such programs. It was hoped that after considering this memorandum the President would be prepared to act on the Executive order. The Director of the Bureau of the Budget and Judge Samuel Rosenman, special adviser to the President, discussed the draft of the order with the President who, however, was reluctant to move on the matter and raised a number of questions concerning the transfer of the Foreign Information Service of the Coordinator of Information, and the Coordinator of Inter-American Affairs. The relation of the activities of the Coordinator of Inter-American Affairs to the proposed Office of War Information was discussed vigorously for over 2 months. Mr. Rockefeller opposed the transfer of the information activities of his agency on the ground that they were an integral part of an over-all program being carried out in cooperation with the Department of State. Since we had a distinctive foreign policy in the Western Hemisphere, something could be said for this point of view. Under Secretary of State Sumner Welles, in a letter to the President dated March 17, 1942, supported this position, indicating that these activities were being handled in a successful and satisfactory manner and that any transfer would result in a protracted period of confusion at the very moment when it was all-important that our relation with the other American Republics should be unimpaired by lack of efficiency or lack of knowledge on the part of the appropriate officials of this Government. At a White House conference on May 15, the President agreed to leave the CIAA out of the proposed order. Another problem presented by the original plan of the Bureau of the Budget for an Office of War Information concerned the place of the Foreign Information Service of the Coordinator of Information. The plan finally adopted, however, called for the transfer of the Foreign Information Service to the Office of War Information and the creation of an Office of Strategic Services under the joint Chiefs of Staff out of the other functions of the Coordinator of Information. Those opposed to an over-all information agency argued that domestic and foreign information should be separate because the differences in aims, purpose, and methods in each field called for a difference in administration, that foreign information should be employed as a weapon of war and should be effectively allied with the military services, and that a tie-up between domestic and foreign information agencies would endanger security , impair the effectiveness of psychological warfare, and risk the exposure of our plans and methods to the enemy. Those in favor of the proposed information agency took the position that the United States should send abroad the same type of information that it released at home since it was impossible under conditions of democratic freedom of speech to divorce the two operations, that both programs should be based on the strategy of truth, and that the control of information policy should be with the civilian rather than the military authorities. The latter arguments prevailed. The transfer of the Office of Government Reports to the Office of War Information grew out of attacks made on OGR in the spring of 1942. On February 2, 1942, President Roosevelt suggested to Lowell Mellett, Director of OGR, that a central information center be established in Washington. This proposal became a target for the critics of the Administration. Since he wanted to avoid brining any disfavor upon the Executive Office of the President, Mr. Mellett went to the President about the matter and they agreed that OGR should be merged with the new information agency. Sometime in May the President indicated that he wanted the whole of OGR transferred in the new order. All the subsequent drafts of the order so provided. The staff of the Bureau of the Budget observed that the press-clipping service was related to the media analysis work being done by OFF and the public inquiry service was related to a similar function performed by the OEM Division of Information. As for field services, the public opinion reporting functions were paralleled by some of the OFF functions and the local public inquiry work was similar to work done by the OEM field services. In addition the transfer would eliminate duplications in services to weekly newspapers and in liaison with Government information agencies. The negotiations conducted in May regarding the proposed order left the question of its issuance in doubt. At the same time that these discussion were being carried on, the Bureau of the Budget was considering the 1943 budget estimates for all the emergency agencies concerned. In a memorandum sent to the President on June 1, 1942, the Director of the Bureau of the Budget linked the need for the proposed Office of War Information with the budget problems involved. This memorandum made a distinct impression upon the President. He asked for additional data about the budgetary situation of the information agencies. In the meantime, negotiations were going forward with reference to the choice of the Director of the proposed Office of War Information. Before signing an order, the President like to associate the terms of the order with the person who was to carry them out. When Elmer Davis, radio news commentator, agreed to direct the new agency, the President signed the Executive order, effective June 13, 1942.7 The establishment of a centralizing authority at this time--just before our first offensive in the Pacific--channelized the flow of public information at a critical period, yet it did not entail new staff since full use was made of preexisting agencies and trained personnel. According to the order, the Director of the new Office of War Information was given th authority, subject to policies laid down by the President and to the provision excluding the CIAA, to issue directives to all departments and agencies of the Government on all matters pertaining to their informational services, and to formulate and carry out, through the use of press, radio, motion pictures, and other facilities, information programs designed to facilitate the development of an informed and intelligent understanding, at home and abroad, of the status and progress of the war effort and of the war policies, activities, and aims of the Government. 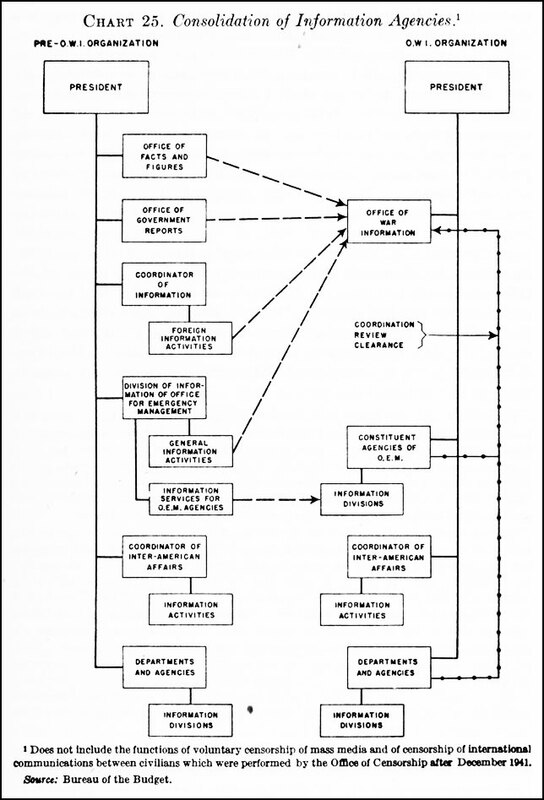 The new Office of War Information, during the first few months of its existence, had to plan for expansion in certain vital operations, satisfy the information needs of the war agencies by keeping production going, and physically and administratively consolidate the constituent parts of the organization. These were not easy tasks and it took 2 years to bring some of them under control. agency had to establish satisfactory working relationships with the Office of Censorship, the Department of State, CIAA, the armed services, the civilian war agencies, and other agencies having war information programs. When OWI was set up, incomplete coordination existed between the Office of Censorship and the information agencies on the types of information to be withheld from publication. It had not been decided whether the same rules that applied to private sources would apply to information originating from Government sources. On November 15, 1942, the two agencies agreed that outgoing OWI short-wave broadcasts would be censored for security only, and not for policy, and that in the domestic field OWI would exercise an affirmative function only, and would, in no case, ask newspapers or broadcasters to withhold anything from distribution. The exclusion of CIAA information activities form the jurisdiction of OWI did not remove the need for coordinating the information work of the two agencies, especially in the short-wave broadcasting field. When OWI took over the Foreign Information Service of the Coordinator of Information, it continued negotiations with the Rockefeller group for the leasing and construction of short-wave broadcasting facilities. The two agencies and the Federal Communications Commission agreed that OWI would assume all responsibility, budgetary included, for the facilities expansion program. On November 1, 1942, just before the Allied invasion of North Africa, contracts were signed by CIAA and OWI, leasing virtually all the short-wave broadcasting facilities in the United States. An agreement between the two agencies regarding the operation of these facilities was not reached until several months later. As far as relations with Armed Services were concerned, Mr. Davis indicated that he had no intention of interfering with communiqués of the War and Navy Department. He did not regard it as his function to determine finally what type of information imperiled national security. Nevertheless, he met daily with appropriate Army and Navy officials to stimulate the fullest possible dissemination of information involving military and naval actions. Chart 25. Consolidation of Information Agencies. leaflets, posters, motion pictures, exhibits, and other information materials. Machinery was established to clear overseas propaganda directives with the War, Navy and State Departments. In dealing with the many complex war problems which we face today, it is unavoidable that there be wide differences of opinion between agencies of the Federal Government--opinions sincerely and honestly held. However, too often in recent months, responsible officials of the Government have made public criticism of other agencies of the Government; and have made public statements based either on inadequate information or on failure to appreciate all the aspects of a complex subject which is only partially within their jurisdiction. served. The Office of Price Administration, the War Production Board, and the other emergency agencies expanded their information staffs and set up tight controls over the release of information. OPA especially found it necessary to guard against "leaks" of information regarding rationing because of the danger of "runs" and hoarding. In the field, OWI continued for a year to provide central services for the emergency agencies. Office of War Information field offices did not expand rapidly enough to perform all the information services which the constituent agencies regarded as necessary. Consequently, constant pressure was exerted by such agencies as OPA to establish agency field information services. Action by Congress in the spring of 1943 turned over the local information function to the constituent agencies. Throughout its career OWI faced a constant series of problems; it necessarily wielded large powers both in this country and abroad that wakened misgivings in Congress and rivalries in the information services of the various war agencies; it found it difficult to satisfy the demands of the press, the radio, and the moving-picture industries; and, finally,m even though its duties as an organization were those of coordination, it was itself an amalgamation of four preexisting agencies; i.e., the Office of Facts and Figures, the Office of Government reports, the Division of Information of the Office for Emergency management, and the Foreign Information Service Branch of the Office of the Coordinator of Information. Over 2,000 people were involved; OWI could not use the services of all of them, particularly in domestic information activities, nor could it preserve the organizations under which they had worked. One of the first tasks facing the newly appointed DIrector, Elmer Davis, was that of creating a working organization and the establishment of new lines of authority. To aid him he had Milton Eisenhower, broth of General eisenhower, who was at that time Director of the War Relocation Authority and who had been Director of the Office of Information of the Department of Agriculture. The first organization plan, the result of a series of conferences in the Bureau of the Budget, was set forth in an Office of War Information Staff Order No. 1, July 10, 1942. It established three branches with an Assistant Director for each branch: the Domestic Branch, a Policy and Development Branch, and the Overseas Branch. Branch, the former as head of the News Bureau and the latter as head of the Motion Picture Bureau. The Overseas Branch was placed in charge of Robert Sherwood, who had been the head of the Foreign Information Service of the Office of the Coordinator of Information. It included those parts of the COI which had been concerned with open overseas information activities as contrasted with secret activities. Excepted was the news-gathering staff in Washington, which was transferred to the News Bureau of the Domestic Branch. Operating activities in New York and San Francisco were continued under Mr. Sherwood. The third branch, the Policy Development Branch, was headed by Archibald MacLeish, former Director of OFF. He had under him the former OFF deputies for departmental liaison and the OFF Bureau of Intelligence. This branch had two primary functions; one was to conduct public-opinion research and the other to develop major information policies for the other two branches. In practice, the Bureau of Intelligence was limited almost entirely to work for the Domestic Branch. Staff Order No. 2, September 11, 1942, transferred practically the entire operating staff of the Policy Development Branch to the Domestic Branch and abolished the Policy Development Branch by implication. Mr. MacLeish continued to serve as Assistant Director of Developing Policies until his resignation on January 30, 1943. With his resignation, the function of coordinating policies of the remaining two branches was absorbed in the Director's Office. Meanwhile, the Domestic Branch was riven from within and assailed from outside. The branch suffered first from a succession of directors. While Mr. Davis gave to the director of the branch a free had, the kind of men that he selected for the post accepted the responsibility only under the condition that they serve for a year or less. They worked in highly competitive fields in private life and were unable to stay away from them too long. [Perhaps the alternative of a tour of duty on the Russian Front would have cured these sociopathic tendencies! One has to wonder how many of the troops were given the option to enlist under the same conditions. --HyperWar] The first director, for instance, was a newspaper executive who had experience running a daily, a magazine, and a radio station. He accepted the appointment only after a direct appeal from the President and on the condition that he return to his private affairs within a year. The high turn-over in directors meant that there was lack of continuity in the leadership of the Branch.10 By the time that one man learned the ropes, it was necessary to break in a new director. It might be pertinent here to note one personnel problem which came up again and again, in both our domestic and our overseas branches, for which we never found a solution. It is not a problem peculiar to OWI; it has afflicted in greater or less degree every ministry of information in a free country. It is the problem of the brilliant and zealous individual who cannot work as part of a team. OWI was not only a team itself but part of a larger team, the Government of the united States at war. We were directed to perform our duties "consistently with the war information policies of the President and with the foreign policies of the United States"; and within a framework of those policies, certain principles of execution and lines of action had to be laid down by the head of OWI. Now an information agency, in a war which was in some of its aspects ideological, naturally attracted many free-lance writers and others who had been used to working by themselves and had always jealously cherished their personal integrity and freedom of expression. Such a man is very apt to insist that he must proclaim the truth as he sees it; if you tell him that so long as he works for the Government he must proclaim the truth as the President and the Secretary of State see it, he may feel that this is an intolerable limitation on his freedom of thought and speech. In that case, he must go. In the spring of 1943 the Domestic Branch faced serious opposition in Congress. The branch was attacked because its internal bickering leading to the resignation of the pamphlet writers, information production activities including pamphlet writing and documentary motion-picture production, and its potentialities as an administration defender made it a target for those opposing the President. The four pamphlets arousing Congressional ire were an anti-inflation tract, a tax primer, a discussion of Negroes and the war, and a cartoon history of President Roosevelt. The latter was not a product of the Domestic Branch and was only distributed abroad. Only with reference to the anti-inflation booklet did the OWI officials admit that they were in error. They defended the other two pamphlets as within the province of their general mandate. As a warning gesture, the House of Representatives abolished the Domestic Branch but it concurred in the restoration of the branch by the Senate. The appropriation finally passed forbade the production of pamphlets, abolished the OWI field offices, and by reason of the drastic cut in funds limited the branch to coordinating activities. their information services in the field. The Domestic Branch became essentially a coordinating agency which planned Government information campaigns on war needs in cooperation with other Government agencies and the communication industries. The Overseas Branch was destined to be the largest and the most lasting part of OWI. Its personnel accompanied our victorious armies all over the world as members of combat propaganda teams and moved into liberated areas in order to furnish a true picture of America's role in the victory and the new world organization to come. Just prior to V-E Day it had more than 8,400 employees of whom about one-half were citizens of foreign countries employed locally abroad in minor capacities. The fundamental problems facing the branch concerned the integration of our foreign propaganda with our foreign policy and military strategy; the bridging of the spacial distance between Washington and New York, San Francisco, London, Algiers, Cairo, Brisbane, Chungking, New Delhi, Teheran, and other outposts; and the selection of the propaganda appeals and media best adapted to save lives and shorten the war. agreement between the agencies reached in the spring of 1944 under which OWI recognized OSS's jurisdiction over secret propaganda. The liaison between OWI and the Department of State presented many problems throughout the war. While the OWI Executive order directed Mr. Davis to perform his functions in a manner consistent with the foreign policy of the United States, it did not specify how OWI could find out what our foreign policy was. OWI officials contended that our foreign policy was determined by the President's speeches and other pronouncements which they could interpret as well as the State Department. In other words, they were reluctant to concede the Department's role in enunciating our foreign policy. Friction developed on both sides. OWI officials felt that the Department of State did not keep them fully informed as to developments abroad and the Department of State officials felt that OWI disregarded their directives and used confidential information for propaganda purposes for which it was not intended. In addition, OWI chafed under the passport regulations and the censorship of materials going by diplomatic pouch. The Department of State could prevent OWI personnel or OWI leaflets from going abroad. The disagreements between OWI and the Department of State also extended to policies. Top officials of the Overseas Branch were outspokenly critical of the friendly policy toward Vichy France, Franco, and the King of Italy. These differences came out into the open in connection with the famous "moronic little King" broadcast sent out by OWI on July 25, 1943, the day on which the fall of Mussolini was announced. The phrase was taken from the broadcast of a commentator, George Grafton, and was broadcast to London to show a trend in American public opinion. It was picked up by the New York Times where it was read by President Roosevelt who made it one of the subjects at his next press conference. OWI was rebuked for not following our foreign policy, but it developed that the Overseas Branch officials had not been informed regarding the negotiations between our Government and the King of Italy. There was no consensus of opinion as to whether the propaganda directives on that day had been properly cleared with the Department of State. The Director of the Overseas Branch, who knew nothing of the broadcast at the time, admitted that it had been in bad taste. Director of OWI pointed out that any reorganization must proceed from the major premise that the seat of the Government was in Washington and so were the headquarters of OWI. Chart 26. 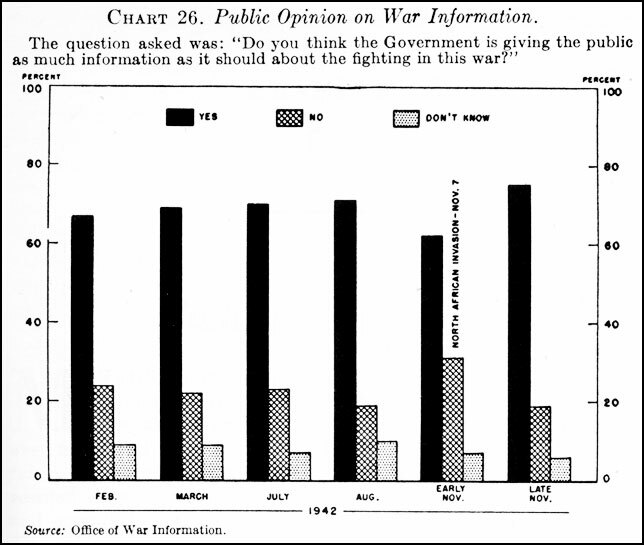 Public Opinion on War Information. board. While the machinery set up was cumbersome and failed to break sharply with the past, it represented an effort to centralize control over policy and operations. The strengthening of topside management in OWI enabled the agency to improve greatly its relations with the Department of State. Representatives of the Department felt that they were really consulted regarding the OWI propaganda directives and they also had greater confidence in OWI's efforts to follow the directives laid down by the Planning Board in Washington. Long before VE-day, OWI was ready with plans for the liquidation of European psychological warfare operations, the correction of distorted information in liberated countries and the continuation of psychological warfare in the Pacific. These plans were much more carefully worked out than those presented by some of the other agencies engaged in similar activities. 1. Federal Communications Commission Monitoring Digest, Dec. 15, 1941 (mimeo). 2. Executive Order No. 8985, Dec. 19, 1941, 6 Federal Register 6625, and 55 Stat. 838. 3. Office of Censorship. A Report on the Office of Censorship. Washington, D.C.: Government Printing Office, 1945. (Historical Reports on War Administration, Series 1) pp. 42-43. 4. Office of Censorship. Censorship Policy Board Minutes, Jan. 7, 1942. 5. Creel, George. How We Advertised America. New York: Harper's, 1920, p. 74. 6. Office of Facts and Figures. Board of Facts and Figures, Minutes, Mar. 31, 1942. 7. Executive Order No. 9182, June 13, 1942, 7 Federal Register 4468. 8. OWI Regulation No. 1, July 10, 1942. 9. White House Press Release, Aug. 21, 1942. 11. U.S. Congress. House Committee on Appropriations. National War Agencies Appropriations Bill, 1945. Hearings . . . 78th Cong., 1st sess., pt. 2, p. 11.